BP Piscium may provide clues about the formation of exoplanets. Nasa's Chandra X-ray observatory has found a star that might have gobbled up its neighbour – another star or a giant planet – shedding new light on the interaction between planets and stars. The star, BP Piscium, is a more evolved version of our Sun, and is located about 1000 light years away in the constellation of Pisces. 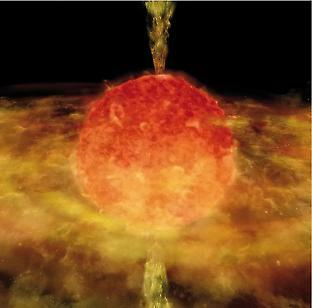 It appears to be a young star but in fact it may be a 1-billion-year-old red giant that “ate” its young companion, leaving remnants that are still visible today. 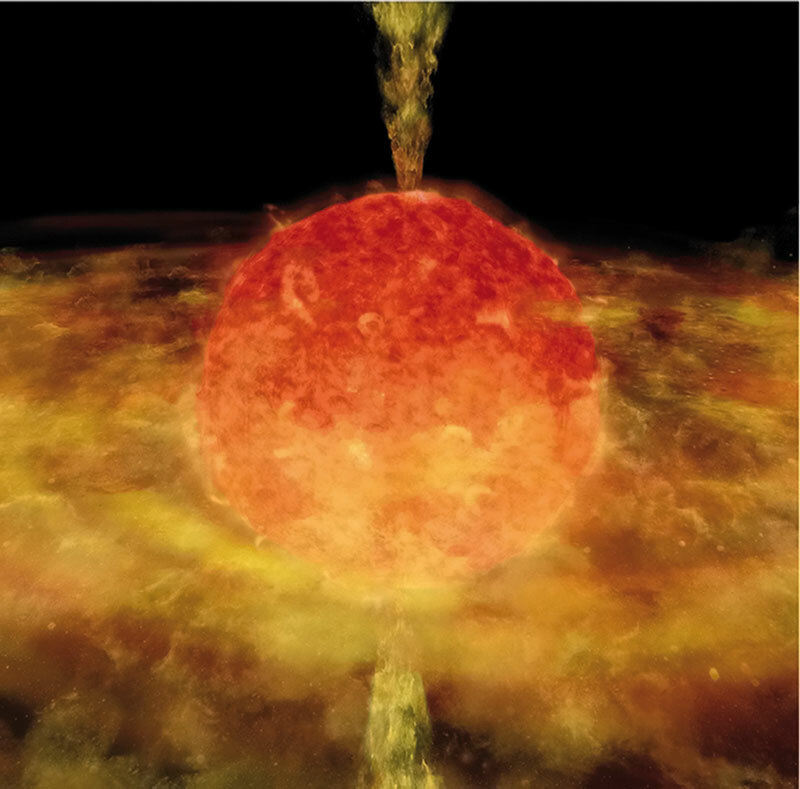 Researchers first started studying the star 15 years ago and were puzzled by its unusual look. Most young stars form in clusters but BP Piscium was isolated. The research team, led by Joel Kastner of the Rochester Institute of Technology in New York, noted that if the star was a young one it would have been a much stronger X-ray source. However, its rate of X-ray production is very similar to old, yet rapidly spinning, giant stars. It also appears to have a dusty orbiting disc, which usually forms planets: a dead giveaway to longevity. Having considered all the evidence, the team decided that they were witnessing a rare case of stellar cannibalism. “The giant star's companion has most probably fallen inside it and got digested,” said team member David Rodriguez from the University of California. “We've never actually caught one in the act.” The scientists believe that some time after BP Piscium started expanding into its red giant phase – the late stage of stellar evolution – it “consumed” its unlucky neighbour. Astronomers believe that what happened to BP Piscium’s companion may at some point happen to our Earth as well. It shows us that stars like our Sun may live quietly for billions of years, but when they go they just might take a star or planet or two with them! Idle computers have become the astronomer’s new best friend. Three citizen scientists, an American couple and a German, have discovered a new radio pulsar hidden in data gathered by the Arecibo Observatory in Puerto Rico. This new deep space discovery marks the first “hit” by the Einstein@Home program, which uses donated time from the home and office computers of around 200,000 volunteers in 192 different countries. This is their first genuine astronomical discovery, and has spurred the group on to do more. The new pulsar, called PSR J2007+2722, is a rapidly spinning neutron star approximately 17,000 light years from Earth in the constellation Vulpecula. Rotating a whopping 41 times per second and unlike most pulsars that spin as quickly, PSR J2007+2722 sits alone in space, orphaned with no orbiting companion star. Chris and Helen Colvin of Iowa and Daniel Gebhardt of Universitat Mainz, Musikinformatik, Germany, are credited with this discovery. Their computers, along with half a million others from around the world, are harnessed to analyse data for the Einstein@Home program using private computer “downtime”. The German-based Einstein@Home program has been searching for gravitational waves in data from the US-based LIGO (Large Interferometer Gravitational Observatory) since 2005. The pulsar search began 4 years later using astronomical observations from the Arecibo Observatory. Operated by Cornell University, it’s the world's largest and most sensitive radio telescope. About one-third of Einstein@Home's computing capacity is used to search Arecibo data. “This is a thrilling moment for Einstein@Home and our volunteers. It proves that public participation can discover new things in our universe,” said Bruce Allen, leader of the project. Who knows, this new “citizens in science” idea may just catch on and expand into other disciplines of astronomy. The sky really is the limit, so if you’d like to take part just go to http://einstein.phys.uwm.edu/.